Important: Office Mix was retired on May 1, 2018. For more help, please read the article below. Just over three years ago we started the Office Mix Preview service to help everyone from educators to business create and share interactive online recordings of their presentations. Thanks to the positive feedback from our fans during the Preview, we are excited to share that we are bringing the best of Office Mix directly into PowerPoint, Microsoft Stream, and Microsoft Forms for Office 365 subscribers on Windows PCs. This new integrated experience in PowerPoint will remove the need for downloading an add-in. 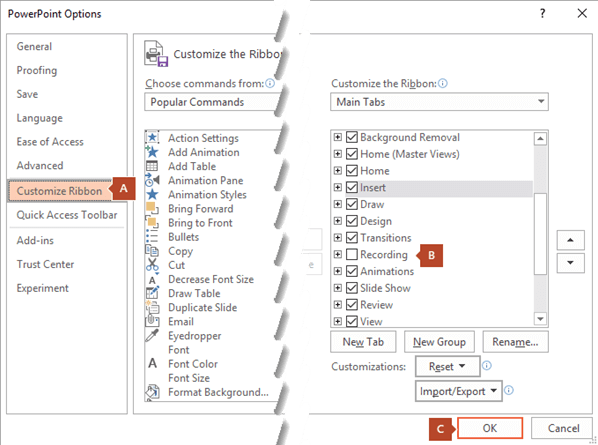 You’ll be able to easily access the feature via the Recording tab in PowerPoint after you turn on the feature by customizing your PowerPoint toolbar ribbon. You will also be able to publish these recordings to Microsoft Stream, which offers a simple way to upload and share videos securely across your organization to improve communication, participation, and learning. This article contains details on the end-of-service plan for Office Mix Preview. We will continually update this article as more information becomes available. I'm a current Office Mix user—What does this change mean for me? What about content that I have already linked from Office Mix to other Web sites? What if my Office Mix content exceeds my Microsoft Stream upload storage limit? I am an Office 365 Administrator. What do I need to know? When will Microsoft Stream support interactive quizzes and analytics? How do I turn on the Recording tab in PowerPoint? When will the Recording tab come to PowerPoint for Mac? How do I upload a video to Microsoft Stream? October 20, 2017: If you have an existing Office Mix account, you'll still be able to view, edit, publish, download, and delete your existing content. If you have a qualifying* Office 365 work or school account, you can sign in to migrate your mixes as videos to Microsoft Stream. If you don't have access to an Office 365 work or school account, you can download your Mixes as PowerPoint files (.pptx), and you analytics data as Excel files (.xlsx) to save to a storage location of your choosing. *Office 365 plan features vary by license. See licensing details to learn if you already have access to Microsoft Stream and what features you can use, or to upgrade your plan. January 1, 2018: You'll no longer be able to sign up as a new user or download the Office Mix add-in from the website. Existing users who already have the Mix add-in installed will still be able to use it to upload, edit, view, and download their existing content. April 6, 2018: You'll no longer be able to upload new mixes or update existing mixes by using the Office Mix add-in. Please sign in to the Office Mix site to migrate or download all your content. May 1, 2018: The Office Mix site and all its content will be officially discontinued. The site will no longer be accessible after this date. Any links to your Office Mix content that you previously shared with others will stop working after this date. Additionally, certain add-ins like Quizzes, Apps, and Polls will no longer be available. Microsoft Forms will come to PowerPoint over the next few months to replace quiz interactivity. For users who have embedded or shared content in a Learning Management System using the Office Mix LTI tool, you can embed content using Microsoft Stream. If you want to remove linked content, simply delete the files from your My Mixes page. On May 1, 2018, all Office Mix content and links will stop working, so please make sure to manually update any embedded Mixes on your other Web sites before this date. If you exceed your available storage limit on Microsoft Stream, the migration of your Office Mix content will be interrupted. Any files that were successfully transferred will remain on your Microsoft Stream account, but any files that couldn't be included won't be backed up and the migration process will stop. Content migration can be resumed after you have freed up or purchased additional storage space on your Microsoft Stream account. To resume an interrupted migration, sign back in to Office Mix and then start migration again. To learn more about the quotations and limitations for Microsoft Stream, click here. If you are an Office 365 administrator, you can share this article with your organization. We are working to bring interactivity to the Microsoft Stream video player so you can build, upload, play back, and share more Mix-like content on Microsoft Stream (that includes quizzes, ability to jump to different parts of the presentation, and more). Over time, we'll enhance the analytics capabilities for videos on Microsoft Stream. For more information about the current capabilities of Microsoft Stream, please click here. On the File tab of the ribbon, click Options. In the Options dialog box, click the Customize Ribbon tab on the left. Then, in the right-hand box that lists the available ribbon tabs, select the Recording check box. Click OK. For more information about the PowerPoint Recording tab, see Record a slide show with narration and slide timings. Currently, the Recording tab is only available to Office 365 subscribers on Windows PCs. In the future we may consider rolling out these features to other platforms over time. You can find the upload button at the top of any page or just drag new videos to one of your groups or channels. You can upload multiple videos at the same time and even browse Microsoft Stream while your videos are uploading in the background. In the Microsoft Stream portal, select Create > Upload a video or the "upload" icon from the top navigation bar. Drag and drop or select files from your computer or device. For more information, see Upload a video. * Office 365 plan features vary by license. See licensing details to learn if you already have access to Microsoft Stream and what features you can use, or to upgrade your plan.